If you’re looking for a deal on a pressure cooker, here’s one that you might be interested in. 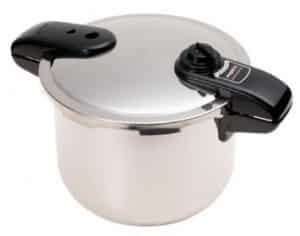 Click here to visit the Amazon site and you’ll be able to score a Presto 8-Quart Stainless Steel Pressure Cooker for $49.97 (regularly $119.00). They’re also offering free super saver shipping since you’re spending $25+. It’s gotten excellent reviews and the same one is going for $64.54 at Walmart. Cooks three to ten times faster than ordinary cooking methods, saving time, energy, and money. Luxurious stainless steel with tri-clad base for fast, even heating. 10-3/4 by 15 by 9-1/3 inches; 12 year limited warranty. *Keep in mind Amazon prices can change, especially for hot deals, so make sure it’s still $47.97 before you add it to your cart.